of this image from Earth’s Wild Ride. A quiet revolution has been taking place in the planetarium world – from “starfield and pointer” shows to immersive, action-film adventures of the full-dome digital theater. 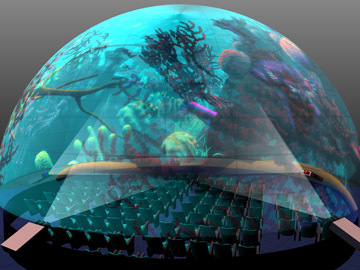 As of this spring, there are more of these full-dome digital video theaters than IMAX theaters. And the Burke Baker Planetarium has led the way – we were the first in the US to premiere a full-dome projection system here in the fall of 1998. Have you ever wondered how we fill the dome with images – especially since a dome is so much bigger than a movie screen? The next time you visit us, look around for the big projector cage that once dominated the center of the dome. 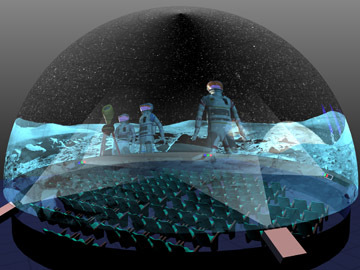 It’s gone – replaced by six high resolution, high brightness video projectors, each filling a portion of the dome with a specific part of a giant fisheye movie. Over eight million pixels are delivered to the dome thirty times each second to create the full dome movie experience. Audiences must learn to turn around and enjoy the motion that surrounds them – and try not to get dizzy in the process. To make the planetarium magic, six computers play their different parts of the giant fisheye movie at exactly the same time and rate. All six must be blended perfectly at the edges and all six projectors must be so alike in color and brightness that it looks like a continuous moving full-dome image. The second trick of full-dome production is to use the dome experience to its fullest. We are now completing the scenes for the upcoming Ice Worlds show, opening on July 4. It is most important to put the visitor in the middle of the action – flying through the icy ringlets of Saturn, landing on the ice moon, Europa, even having a polar bear paw land on your head. If you haven’t visited the Planetarium recently, it’s time to join the adventure and experience the action. Next Post Science Friday! What's going on in your brain?